It’s hard to write a legitimate review when the only reason you agreed to do it was for a free ticket to one of your favourite bands. It’s even harder when you’re told not to write good reviews because nobody hires “that guy”. Alas, here’s a review of one of my favourite bands and their incredible support. Introducing: Fairport Convention and Sally Barker (respectively). Hastily penned notes hurriedly tapped into a cold, hard phone screen seems a harsh juxtaposition to Fairport’s classic sound. Pondering over the long-standing “Winter Tour” tradition I’d just witnessed while sat in the pub next door was a vain attempt to soften the “post-gig blues” amid the veritable no man’s land between venue curfew and the foreboding notion that was the last train back to Huddersfield. I could sing Fairport’s praises indefinitely, whether we were to discuss their understated mastery of odd time signatures, Nicol’s hybrid-picked control over the guitar, Pegg’s weaving bass lines or Sanders’s astounding delay-laden fiddle. However, my distaste for stories that start with a teaser of the ending bleeds through and I must, ironically, begin at the beginning (of this night, at least). Climbing the stairs into one of the most traditional “music hall” venues I’d ever set foot in, I was greeted by the steward with a crack of “Ah, the under 60s have arrived!”. Unfortunately, he was correct. The joys of Fairport Convention seem to have been lost on the younger generations (not for lack of trying on my part) but that didn’t matter. Taking seats, the mood washed the entire crowd without exception. There was excitement in the air. We were all there for the same reason. Sally Barker’s opening E minor chord (also an open chord) begun her set as it meant to go on. A deep, dark, melancholy tonality almost wept from her guitar which, without encountering her previous material, left me unsure of the set’s direction. Her masterful vocal control and quality certainly reflected her successes with “The Voice”. With the chord progression continuing to the C and D, as did her music cycle through tales of revenge, heartache, scorn and greed all succinctly packaged in the audience participation refrain of “talk, talk, talk about money” (with a descent to the major third in place of the minor, sure to warm even the heart of the coldest Prog Snob). An unexpected guitar talent (the “unexpected” side of which being an unfortunate side effect of becoming a TV vocal presence), Sally’s songs were chordally intricate, displayed exciting use of fingerstyle, coupled with large dynamic range resultant of “Slap Bass” style attack in places. Sally’s set ended with Fairport taking stage to join her for a rendition of her 21-year-old LCM student son’s piece I’m Not Whole. Not my favourite of her set however, but the agathokakological track was carried by Fairport Convention’s backing; giving the upbeat misery a life of its own driving well into Fairport’s staged coup. Sally Barker was tremendous and, as she vacated the stage, I knew to eagerly expect her at later points in Fairport’s set; as is tradition on these cold nights of the winter tour. Sally Barker is an act to see again, whether with Fotheringay or in her solo works. Fairport Convention’s tour marks their 50th anniversary as a band, difficult to forget with their aptly titled 50:50 @ 50 album for sale during the show – containing an even split of live and studio material – marking the momentous occasion. Even more difficult to forget with their shameless, yet still tongue-in-cheek plugging of the release. A sad reflection of Fairport’s career under-the-radar. 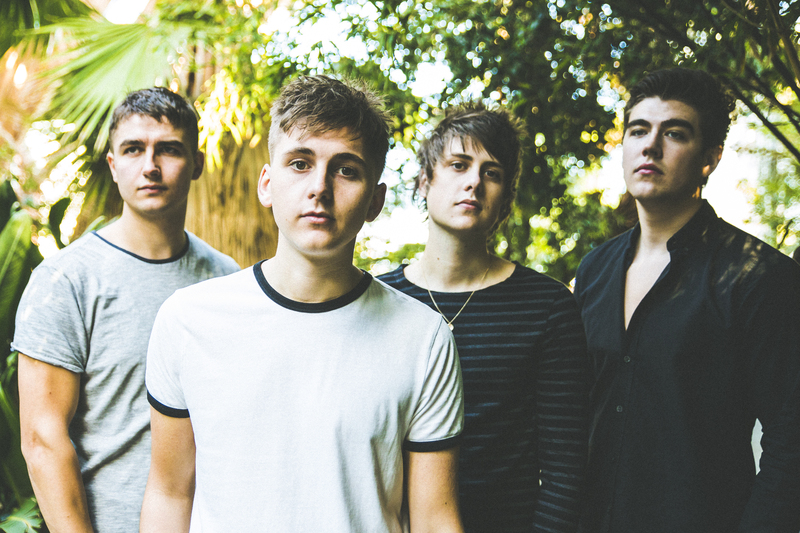 While mainstream success is not necessarily the goal, the band have amassed a faithful following throughout their tenure on the folk scene and the fan’s dedication is shown to be well placed by the quality of musicianship and songcraft on display. Though on their 50th birthday, these folk-rockers (or metalhead in the case of bassist Dave Pegg) are certainly not past their prime; merely different. 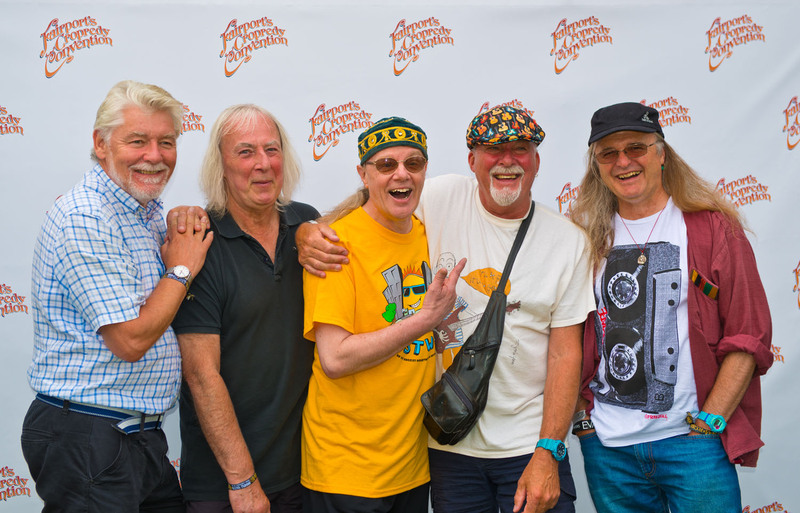 This current lineup is Fairport Convention’s longest standing, and is a well-oiled machine as a result. It was wonderful to hear classics from throughout their career such as Genesis Hall, Matty Groves and Farewell, Farewell revisited standing side by side with their more recent material, the last of which had never been brought to stage during the era of the Liege and Leif album from which it hails. The spectacle was engaging for both the audience members in the “cheap seats” (such as myself) and the boxes above despite the shouts of “rattle your jewellery then” being made in jest by guitarist and singer Simon Nicol. The band’s light comedy between songs is something of a rarity in most contemporary pop or rock acts, and was a bonus of the evening. The band don’t take themselves too seriously and the interaction made the audience more comfortable and made the night akin to sharing a few beers and a song around the fire with some good friends rather than the potentially overbearing prospect of visiting a packed music hall to sit quietly and listen to a live act. After taking a short interval, Fairport Convention returned for a second set (value for money) which led to the only downfall for the show. The first song of the band’s that I was ever introduced to (Lord Marlborough, the opening track of the 1971 album Angel Delight) was played over the PA during the interval, so I sat disappointed that I wouldn’t get to hear the track live, though a live version is included on the 50:50@50 album. More of the same level of excellence was to come, along with a return of Sally Barker to accompany the band for a rendition of Rising For the Moon from the album of the same name; the last to feature vocalist Sandy Denny. The piece was excellent, remembering Denny’s vocal embellishments perfectly though the band’s updated sound made the song still relevant without being a rehash of old material. Portmeirion and The Girl From the Hiring Fair were other songs of note from the evening were Sander’s “Save our NHS” speech was met with a divided crowd from a self-proclaimed “hippie pacifist” and a pensive ballad of first loves that had the whole audience silent. But the spell was soon broken. Ending with the aforementioned Matty Groves only to come on with an encore; though great, the set would have been finished perfectly there. The packed train home was awaiting me and the band were to move on to the next night: such is life on the road. There we have it, Fairport Convention’s 50th anniversary show with Sally Barker. An amazing night, which can be continued for a full weekend at their Cropredy festival from between the 10th and 12th of August. 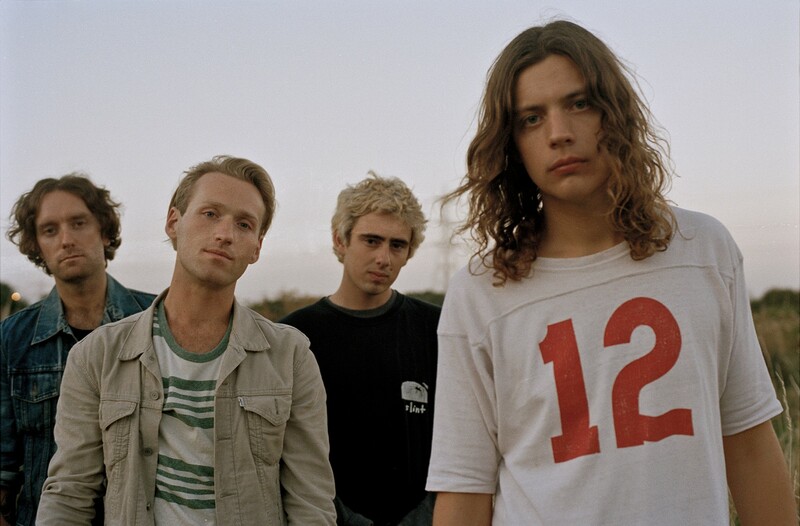 With only a handful of singles and one EP to their name, Noisy indie-rockers VANT have been carving, for themselves, an extremely loyal fan base – including BBC Radio 1 DJ Annie Mac. Current single, PEACE & LOVE, is the fifth in a row that she has named her ‘Hottest Record in the World’ and to receive repeated commercial airplay. Embarking on a solo tour of the UK, after a support slot on You Me At Six’s academy tour last month, Mattie Vant and his eponymously-named band of indie-hippies are out to astonish. Opening support act, and local lads, Part Time Miserables impress with a solid set of schizophrenic-sounding noise rock songs, but fail to convey any charisma in their performance – even through a cover of The Stooges’ I Wanna Be Your Dog. That’s okay though, because Californian exports PARTYBABY have got charisma in spades. Their mission is clear. So clear in fact that is literally in their name – to party. Frontman Jamie Schefman showboats his way through an often-cringey set of pop rock tracks. Holding his guitar aloft and theatrically falling to his knees, he delivers each nasal chorus with an enthusiasm that cannot be matched by many – and the audience absolutely lap it up. If the crowd are in any way disheartened by the near-torrential rain they’ve faced to be there, they do not show it a bit, whooping and hollering as VANT take to the stage. Any fears that the headliners may struggle to contend with the showmanship of their support are immediately swayed as they rip through their first song. What the audience lack in numbers, they more than make up for in spirit, singing VANT’s lyrics back to them amidst wall to wall moshing and crowdsurfing. 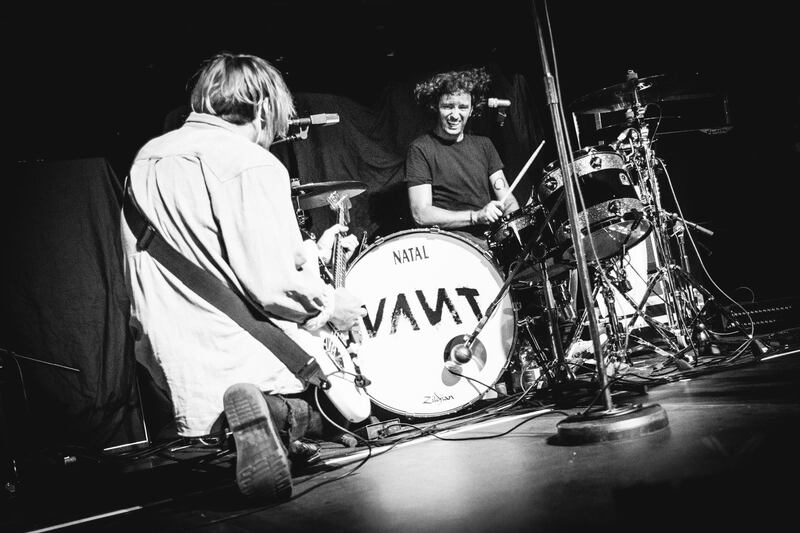 They are given no room to breathe at all between songs, with VANT opting instead to riff their way through their five opening tracks with no breaks. 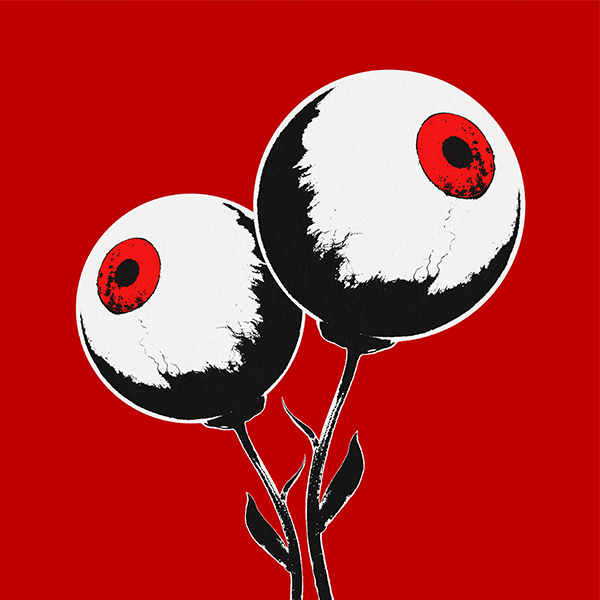 The normal catchy indie-rock tracks conclude now in 30 second feedback-laced freak-out sessions. Frontman Mattie Vant preaches love and acceptance between songs, insisting that the audience stand together as a collective against the injustices of our time (namely the EU referendum results and recent presidential election). The highlights of the show, however, come far too late in the set – the majority of the performance soon becoming forgettable. Not boring, but nothing entirely memorable. It is not until eleven songs in that they begin to play their big hits. And this is where the set begins to really shine. Parasite and Parking Lot both drive the crowd into a frenzy – individuals sit on their friends’ shoulders and gatherings of friendly strangers with their arms around each other jump around manically as if all their worries had been taken away. The opening chords of fan favourite Fly-By Alien ring out briefly. An eruption of excitement from the fans is followed by a disappointing silence as they realised Mattie has snapped a string. The discontent is soon swayed as the guitar tech brings on a replacement guitar and now the crowd are expecting it. As Vant repeats the same hook, through a fresh guitar, the crowd scream the lyrics at him as if they are part of the performance now. After a very transparent false ending and encore, the band departs with a punchy cover of M.I.A’s Paper Planes. The crowd are left to endure the rains outside once more, but most feel that this has definitely been worth it. 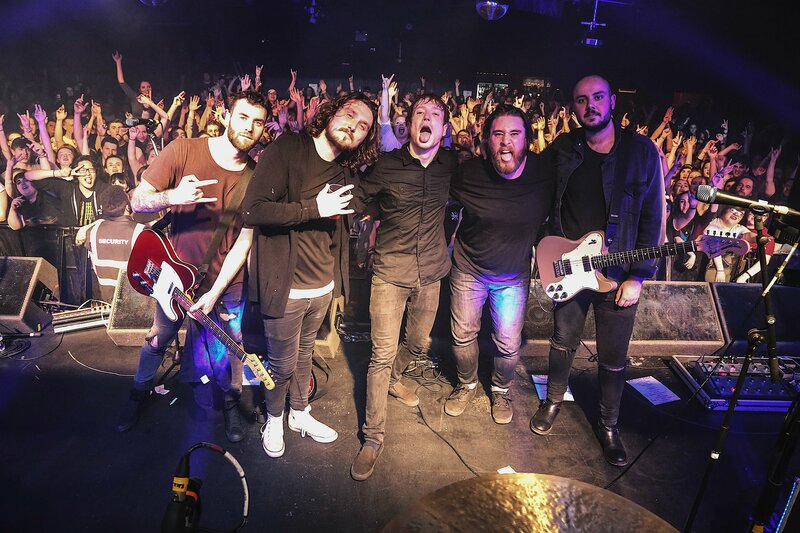 Metalcore party-starters Eskimo Callboy are in the middle of a European tour and are about to play at Key Club in Leeds for the first time after a summer spent playing various Impericon Festivals. 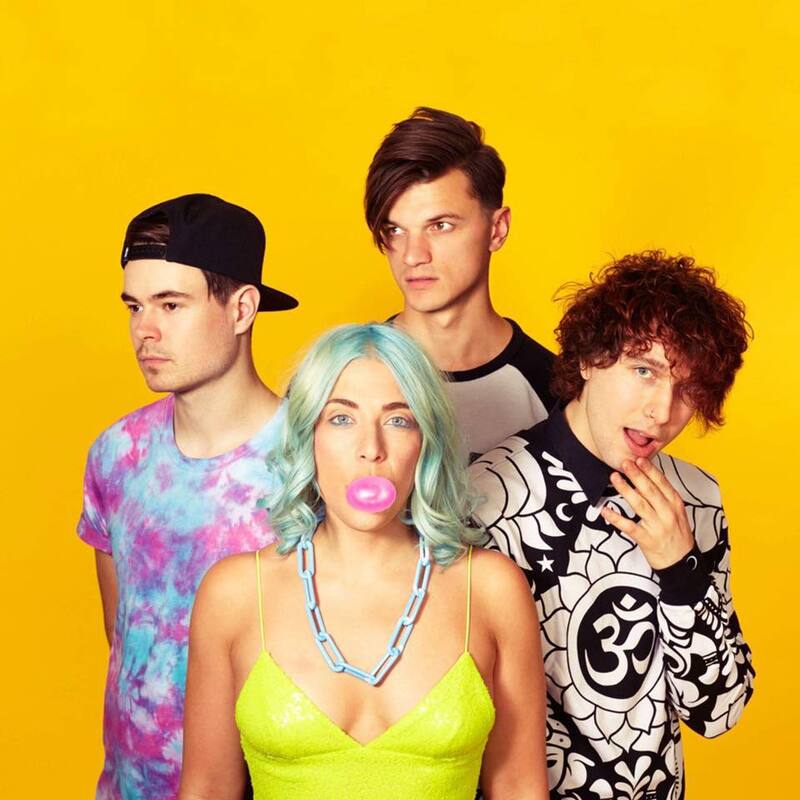 Their third studio album Crystals was released in 2015 and made it to 6th on the German chart and represented a step up from their second album We Are The Mess. Joining them on the UK leg of the tour are five-piece metal band Her Name In Blood from Tokyo whose quick paced, half hour set to a somewhat-sparse crowd receives a rather lukewarm response. Managing to get a 3-person circle pit going for their final song, they end their set with relatively popular song LAST DAY and announce they will be by their merch table should anyone want to meet them. Also supporting them are Palisades. The Electronicore band from New Jersey attract a slightly larger crowd, possibly due to their musical similarity to the headliners. ‘Dabbing’ their way through their half-hour set, they play their cover of House of Wolves by the legendary My Chemical Romance. The group demand the attention of everyone in the venue and then follow it up by getting political and saying “those of you who were following the election will know we just elected a f****** dumbass. 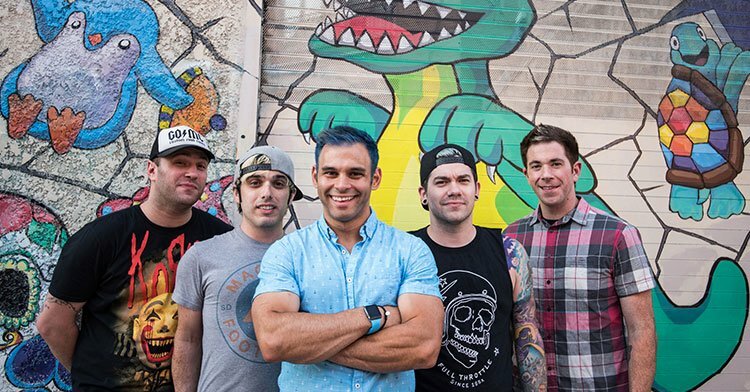 We don’t stand for any racism, sexism, xenophobia or homophobia so if you agree with any of those things, walk on right out of here” before playing new song Aggression. 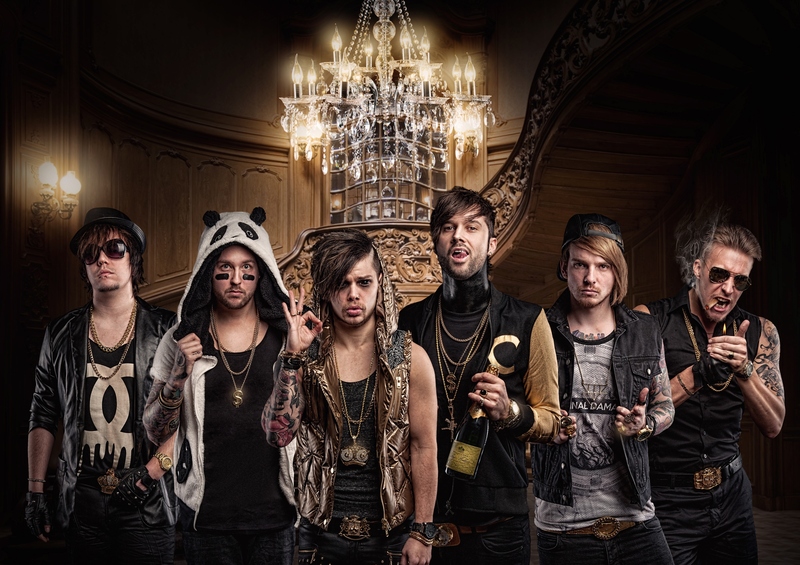 Announcing their arrival onstage with EDM that will make you wonder if you’ve accidentally stumbled upon Tomorrowland, Eskimo Callboy quickly let the half-capacity crowd know how the night is going to go with a fancy display of smoke, strobe lights and more smoke. Opening with Crystals, vocalists Sebastian “Sushi” Biesler and Kevin Ratajczak scream for the crowd to “put your mother-f****** hands in the sky” and without hesitation everyone in the room raises their arms and starts jumping. With a setlist containing mostly songs from the new album, it’s clear to see that they are happy to leave the majority of their back catalogue in the past however the appearance of singles We Are The Mess and Party At The Horror House highlights that they still have some classics to play and the crowd will sing every word back to the six-piece from Germany. Performing to a backing track means that the edm-style breakdowns can be perfectly recreated live however it does mean that sometimes it is hard to differentiate between Biesler’s live vocals and what has been pre-recorded. Anyone that’s ever been to a gig in Leeds will know to expect the crowd to start chanting “Yorkshire! Yorkshire!” at some point during the bands set and Ratajczak said that it reminded him of the terrace chants at a football match and started an indistinguishable shout. Then saying that “the next song goes out to the most important people in here and that’s you,” the band played what they said would be the last song tonight Walking On Thin Ice before coming back for an encore. Starting the encore with Baby (T.U.M.H) which is a cover of popular 90s group NSYNC’s Tearin’ Up My Heart, they follow it up with a cover of Skrillex’s 2011 remix of Cinema before pausing for the customary photo with the crowd and ending the energetic night with Is Anyone Up? from 2012 album Bury Me In Vegas.